The red arrow points to the original cancel. Also note the straight edge on the right. 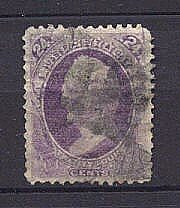 The stamp to the left was altered and resold as the very rare Scott #142 on the right. 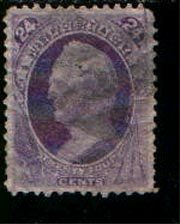 QUESTION: If the original seller misidentified the stamp because he didn't notice the grill, and "chickfrdstk"/"schuylerac" simply made a lucky purchase, why would they feel the need to add a second cancel and make it a less attractive item? REPERFED AT RIGHT!! THE STAMP DISPLAYS A PARTIAL STRUCTURED GRILL WITH A SERIES OF GRILL POINTS IN LINEAR ROWS. IT APPEARS REALISTIC. IT CANNOT BE MEASURED FOR DEFINITE VERIFICATION AND AUTHENTICITY AND IT IS SOLD AS IS WITHOUT ANY IMPLICATION MADE OR IMPLIED THAT THIS IS A GENUINE GRILL!!!!! 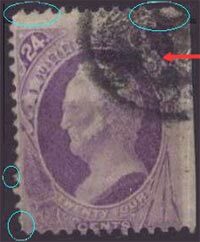 While the seller "schuylerac" does mention the reperforation job to the right side of the stamp, he neglects to say who did it. Was it "chickfrdstk" or "schuylerac"? The stamp on the left normally doesn't have a grill as issued. It has found a new life on the right. 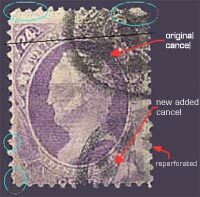 SMALL CLOSED TEAR--THE STAMP DISPLAYS A PARTIAL STRUCTURED GRILL WITH A SERIES OF GRILL POINTS IN LINEAR ROWS. IT APPEARS REALISTIC. IT CANNOT BE MEASURED FOR DEFINITE VERIFICATION AND AUTHENTICITY AND IT IS SOLD AS IS WITHOUT IMPLICATION MADE OR IMPLIED THAT THIS IS A GENUINE GRILL!! Once again, the magical appearing grill shows up and philatelic history is made!